There are 2 different projects in this set. For the 1st butterfly project, students find examples of colorful parts in their stories: colorful verbs, adjectives, characters, and plot. For the 2nd project, students write about the main elements of their books: setting, characters, plot, solution, and conclusion. 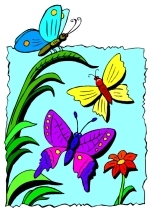 Butterflies are one of the most colorful creatures that can be found, and this butterfly book report project focuses on colorful writing. Students have to find examples of the author using colorful verbs and adjectives in their book. Then, they have to write a colorful description of the main character and explain why the plot of the book is colorful and interesting. 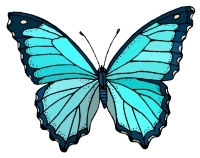 This Butterfly Book Report Project will provide you with all of the teaching resources that you need for your students to review finding and using descriptive verbs and adjectives, and then using colorful verbs and adjectives in their own writing to describe the main character and plot of their book. Traditionally, requiring students to find examples of verbs and adjectives in a book is a task that most students find quite boring. Before students start this task, they are given example sentences of descriptive verbs and adjectives on their first draft worksheets. 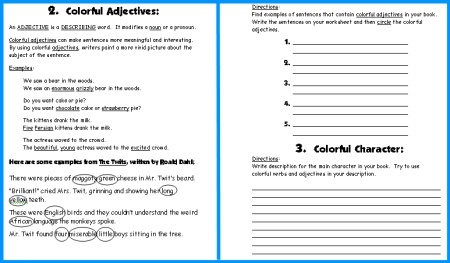 These first draft worksheets also contain examples from the book The Twits by Roald Dahl and example sentences of how Roald Dahl uses descriptive verbs and adjectives in his writing. 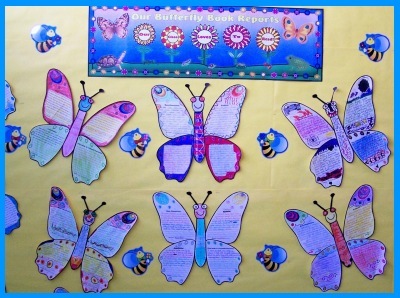 By using this butterfly book report project that emphasizes colorful writing, your students will want to spread their wings and fly into these grammar and writing activities. 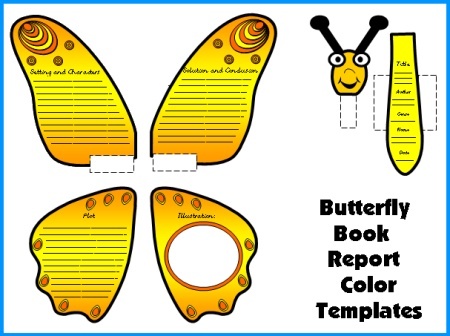 Both butterfly book report projects contain five worksheet templates that assemble into a butterfly. 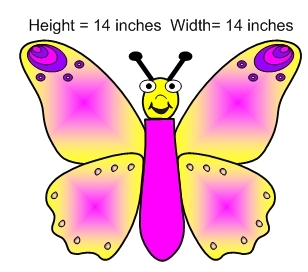 The finished butterfly projects measures 14 inches in width and 14 inches in height. These finished book report projects will make a colorful classroom bulletin board display of your students' work. 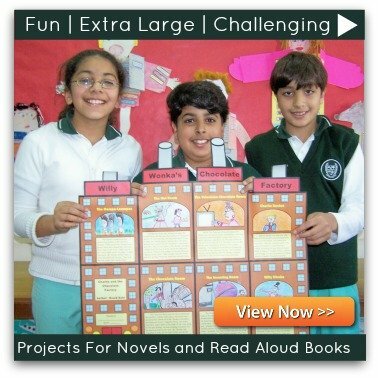 Everything that you need to complete these projects is included in this resource set. All that you will need is scissors, glue, tape, and coloring pencils. There are 17 worksheets and template pages in each butterfly book report project, as well as a 5 page color bulletin board display banner. There are 13 pages of flower accent pieces that match the flowers in the bulletin board banner, for you to use to help you decorate your bulletin board display. 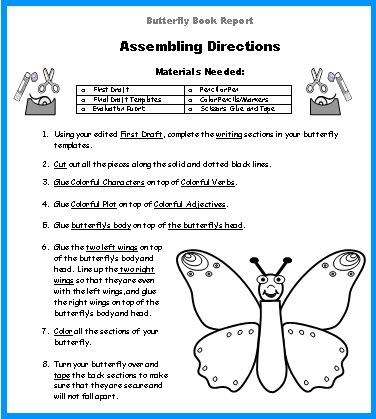 This set includes an assembly directions worksheet on how to prepare and assemble the butterfly project. 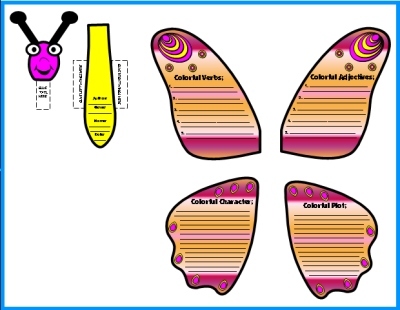 Below is an example of the colorful butterfly assembly directions worksheet. 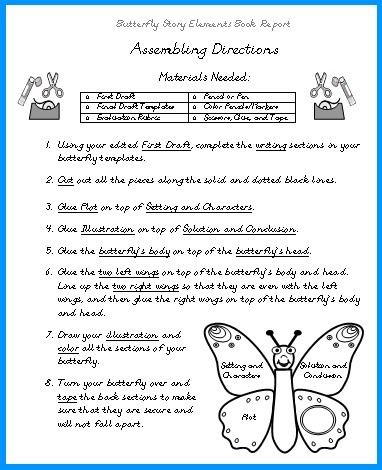 Below is an example of the story elements butterfly assembly directions worksheet. 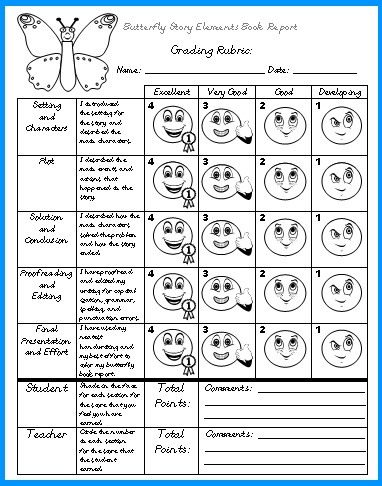 This butterfly book report project includes a grading rubric. 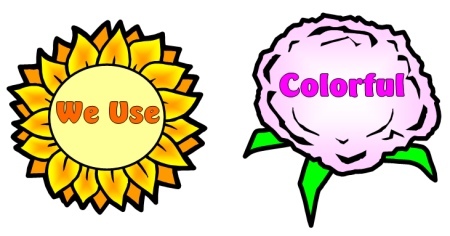 Since this project uses the word color in it numerous times, there is an additional set of each resource that contains the UK spelling of colour for each rubric, first draft, final draft templates, and the flower accent pieces. 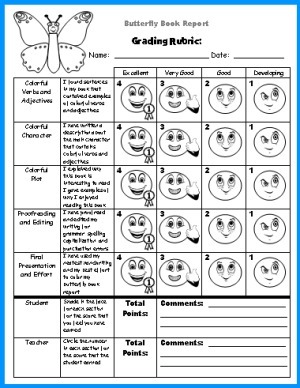 Below is an example of the colorful butterfly grading rubric worksheet. Below is an example of the story elements butterfly grading rubric worksheet. Left Top Wing - Colorful Verbs: Students find examples of sentences that contain colorful verbs in them. Right Top Wing - Colorful Adjectives: Students find examples of sentences that contain colorful adjectives in them. Left Bottom Wing - Colorful Character: Students write a description for the main character and try to use colorful adjectives and verbs in their writing. Right Bottom Wing - Colorful Plot: Students explain why the plot of this book is colorful (interesting) and why they recommend that other students read this book. This set contains five worksheets for students to write their first drafts on, the first four worksheets are shown below. On my first draft worksheets, I have designed the writing line spaces to match the spaces allotted on the final draft butterfly templates. 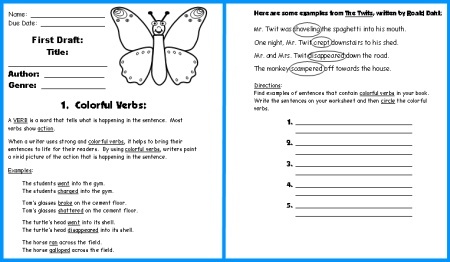 These first draft worksheets contain example sentences using colorful verbs and adjectives for the students to read before they try to find examples of these parts of speech in their own book. There are also examples from the book The Twits by Roald Dahl so that students can read examples from a particular book. 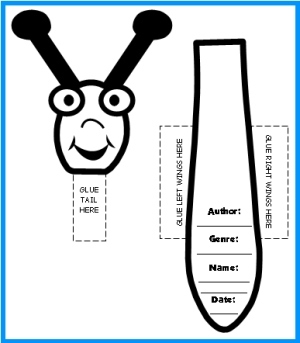 Below is an example of the first draft writing worksheets for this book report set. 4 of the 5 worksheets are shown below. This set contains two worksheets for students to write their first drafts. On my first draft worksheets, I have designed the writing line spaces to match the spaces allotted on the final draft butterfly templates. 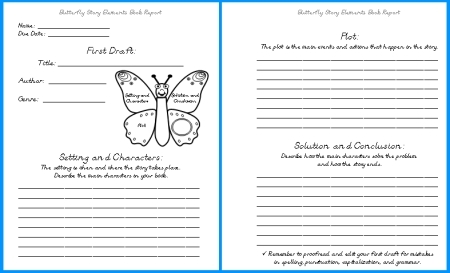 Below is an example of the first draft writing worksheets for this butterfly book report project. This butterfly book report project includes 5 templates that assemble into the shape of a butterfly. Below are examples of the 5 colorful butterfly black and white templates. 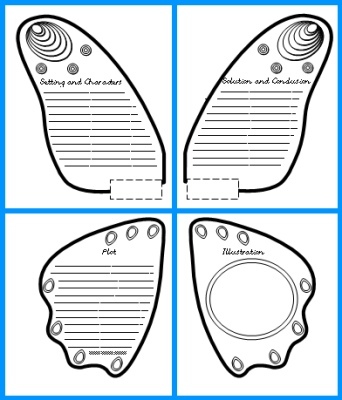 Below are examples of the 5 story elements butterfly black and white templates. When I am first introducing my students to a new book report project, I believe that it is important for them to have a visual example of what their final draft book report projects should look like. I always assemble the butterfly book report project myself beforehand and display it at the front of my classroom for my students to see. My students enjoy seeing my butterfly book report first. They also enjoy hearing about the book that I chose to do my book report on, and this gives me a great chance to promote a book that I would like to encourage my students to read. 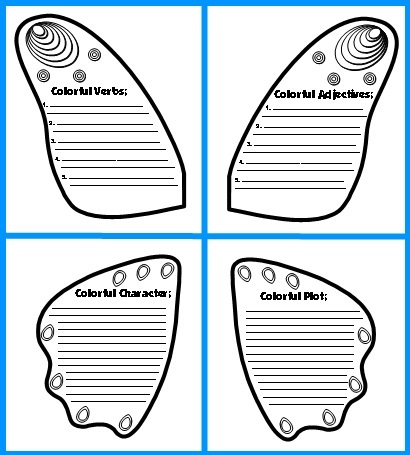 To save you time in coloring your example that you show your students, I have included color butterfly templates of this project for you to use. 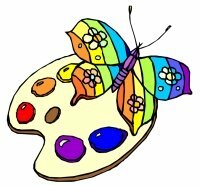 Below are examples of the 5 colorful butterfly color templates. 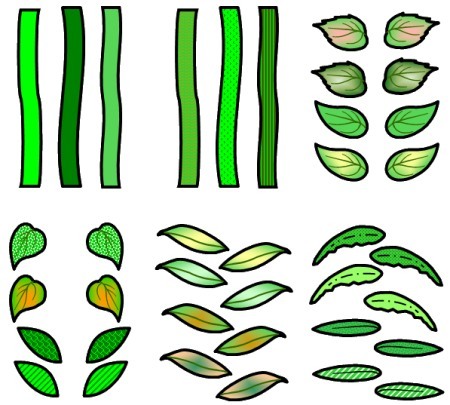 Below are examples of the 5 story elements butterfly color templates. This time is valuable and better spent on developing your classroom curriculum and grading papers, so I have designed a matching 5 page display banner for your bulletin board. 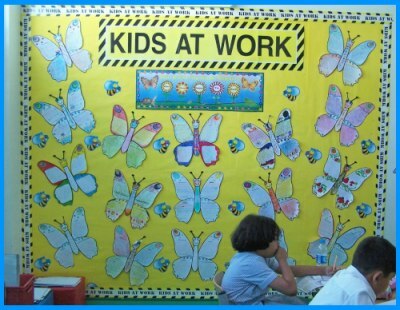 If you have access to a laminating machine, you can laminate your banner so that it is durable and you can use it year after year for bulletin board display of these butterfly projects. The words inside the flowers on this banner say "Our Class Loves To Read!" EXTRA GOODIES: For some of my book report sets, I am able to think of, and create, additional accent pieces to help you in decorating your bulletin board displays. This Butterfly Book Report Project includes a set of flowers that match the flowers in the display banner. This set includes stems and leaves that will help you to assemble these flower accent pieces. These flowers say "We Use Colorful Verbs and Adjectives In Our Writing." You will be able to design a colorful and dynamic bulletin board display using your students' finished butterfly book report projects. 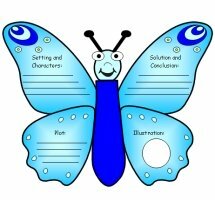 These butterfly graphic organizers are a unique and fun way to get your students excited about completing a writing assignment about the books that they have read. The writing responses that are required of your students will have them searching for examples of descriptive verbs and adjectives in their books. Then, students use colorful verbs and adjectives in their own written responses. In addition, this butterfly book report set includes some flower bulletin board accent pieces to help you in decorating your bulletin board for this colorful theme. Matching Caterpillar Book Report Projects! 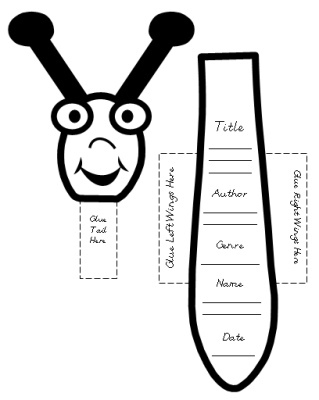 I designed two matching caterpillar book reports. I wanted to create a colorful spring book report bulletin board display that contained both caterpillars and butterflies. 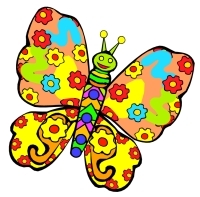 The writing spaces in the butterfly's body match the writing spaces in the caterpillar's body for both book report sets. The first draft worksheets and grading rubrics are exactly the same except for the graphics on them. is the shape of the butterfly and caterpillar templates. These identical projects will look great displayed together! 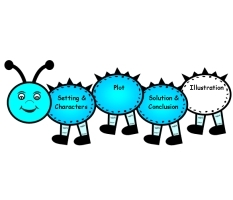 I give my girl students the butterfly templates to write their book report projects on and my boy students the caterpillar templates. 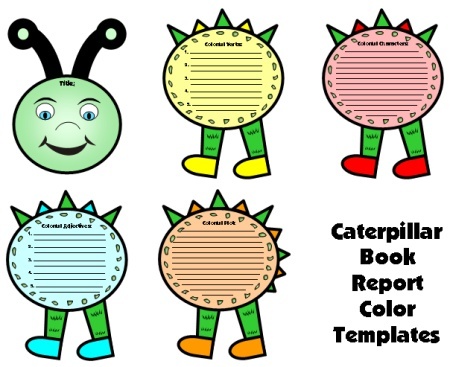 By having my students write in two different book report templates, I can then create a dynamic bulletin board display full of both caterpillar and butterfly book report projects. 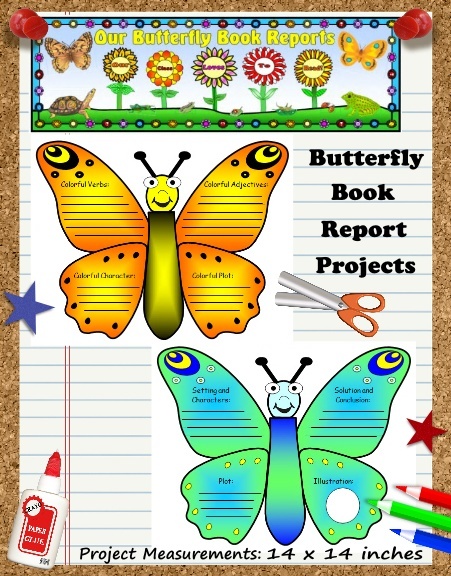 These caterpillar and butterfly book report projects can be used separately, I am just making a suggestion that worked well for me, and I liked the idea of having my girl students work on butterfly shaped templates and my boy students working on caterpillar templates. For the 1st caterpillar project, students find examples of colorful parts in their stories: colorful verbs, adjectives, characters, and plot. 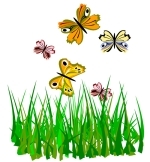 Thank you for visiting this Butterfly Book Report Projects page.